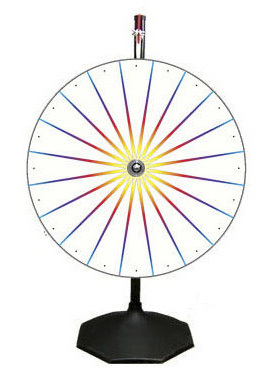 Casino Supply White Prize Wheel with Stand & Base: 24"
Our professional discounted quality White Prize Wheel with Stand & Base features brilliant color graphics printed using the latest digital printing systems. All of our white wheels have standard 20 sections. We take great pride in hand-building and balancing every one of our wheels in our 38,000 square foot facility in Dallas, Texas. Our durable dry-erase laminate finish easily wipes clean, even after several months! Don't be fooled by cheap plastic prize wheels. Our wheels are sturdier and much more durable. We build our wheels to last a lifetime! 24 inch, 30 inch, and 36 inch wheels include a standard 18 inch octagonal ABS black plastic base and a black powder-coated steel pole. These wheels stand 36 - 45 inches tall, depending on the size of the wheel. 48 inch wheels include a heavy-duty 6 foot tall steel pole with a 22 inch base. 0" x 0" x 0"
This product is shipped from our warehouse in Carrollton, TX, USA.